Whether you break bread with the traditionalists when it comes to foods of the Asian persuasion, or you prefer yours with a side of modern fusion, Brisbane is packed full of spots to chow down on your favourite Asian dishes. From Banh Mi to Bingsoo, Pho to BBQ Pork Buns, we’ve put together the ultimate Asian Food Trail from Brisbane’s north to south and everywhere in between. Kicking off with an oldie but a goodie, Mrs Luu’s has been serving up fantastic Banh Mi for years! Nailing the crunchy-to-soft ratio of their bread rolls, and always generous with the fillings, these guys get queues round the block on the daily! Open 24-hours (that’s more like the Asia we know and love!) Kwan Brothers is perf for a late night snack to ease those hunger pangs. Taking culinary inspo from all your fave Asian haunts—Singapore, Thailand, Hong Kong and Japan—the menu is a what’s what of the travels from your early 20s! Try Brother Kwan’s Ice Cream Bao’s; deep fried bao stuffed with ice cream is always a crowd pleaser! Causing a city-wide food addiction to bao buns, Bao Down Now nail these fluffy little clouds of awesomeness. It’s hard to pick a standout, but we say the Crispy Hot and Sour Crab comes in on top. Looking for authentic Chinese in Brisbane city? Almost impossible… Bar one. Happy Boy brings the best of Provincial China to the bellies of Brisbane, with a killer list of matching wines from the crew at Spoken Wine. The Fish Fragrant Eggplant and Hong Kong Long Spring Rolls are long-standing faves on the seasonally changing menu here because they’re so freaking good! One of the most popular snacks in Japan, the humble act of grilling meat on a stick—yakitori FYI— is anything but blah! One of only a handful of Yakitori bars in Brisbane, Bird’s Nest serves up crazy-good traditional yakitori skewers with a great selection of Japanese and Aussie beers to quench your thirst! Sunnybank is choc full of great, authentic food spots, and if you frequent Little Taipei on the regs, you’ll have your fave spot. Us? We can’t get enough Pho Hung. Tucked away amongst the myriad of food offerings in the precinct, it’s a total blink-and-you’ll-miss-it eatery. Don’t let the metal chairs and overhead lights fool you though, their Beef Brisket Pho is one of the best in Brisbane, hands down! Simply shaved ice topped with sweet things like fruit, red beans, and condensed milk, it’s as if the Korean dessert, Bingsoo was made for us QLD residents. Hats off to Surabing, who make some of the best Bingsoo out there! Want a more traditional taste? Go the Green Tea flavour. Want to go all out? Their Cookies and Cream is insane! Do you know anyone who doesn’t love yum cha!? An institution in Sunnybank, all 400 covers at Landmark Restaurant are almost always filled, with queues round the clock for a taste of their iconic lunchtime feast. Prefer dinner? The crispy Peking duck is sinfully good. Pumping with atmosphere, no trip to Inala is complete without a whistle-stop tour of the Inala Asian Food Market. Bag yourself some sweet deals on your grocery shop, then stop in any one of the street-side cafes for a bowl of fresh Pho or Vietnamese coffee. A hidden treasure, Tân Thành is Inlala’s best kept secret, and should defs be on your Brisbane bucket list! Arrive with an empty belly, then fill up on Com Tam (pork chop, shredded pork skin, pork cake, a fried egg and pickled veg, then wash it all back with their kitsch Tri-Colour Coconut Milk. Serving up some of the best Vietnamese coffee this side of the Mekong, Café O-Mai has a loyal following (good luck getting a table on the weekend!). Their insanely good Viet-spin on the best meal of the day takes brekky to nek level, with the breakfast bahh mi with house made crackling pork a total winner. 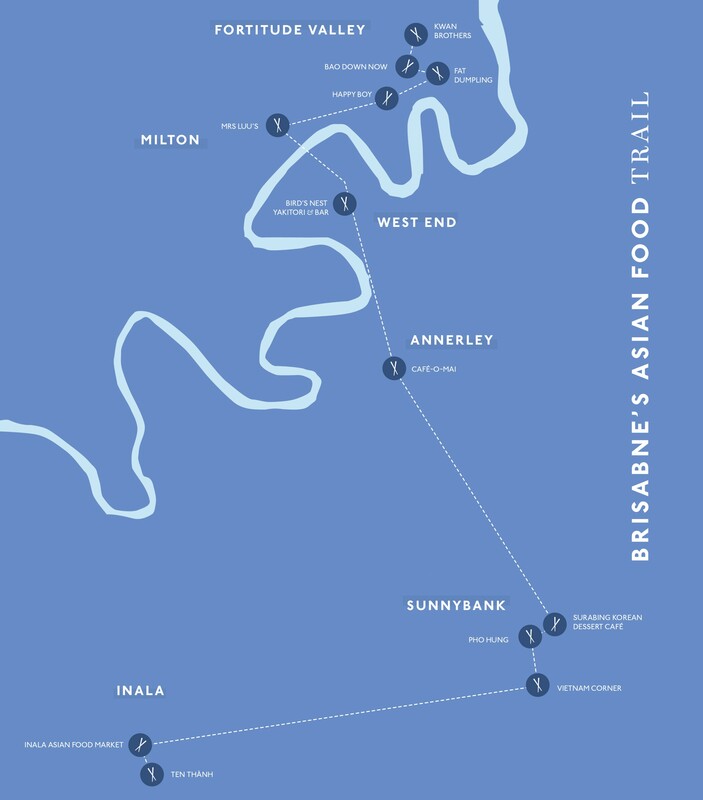 Looking for more of Brisbane's best Asian food? Check out Brisbane's best dumplings 2016 edition! on site now.